The Island of Hawai’i is called the “Big Island”. You’ll find 11 out of 13 of the world's climatic zones here. The immense diversity is exemplified by showcasing the world’s most active volcano, Kilauea, and Mauna Kea, the tallest mountain in the world if measured from its origin on the ocean floor. 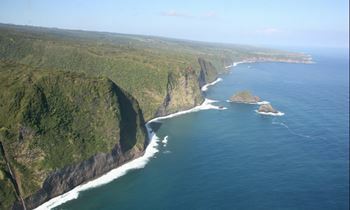 View the magnificent coastline of Hawaii's Big Island, from Kona to Captain Cook, then back up to Hualalai and Kiholo Bay. See the beautiful beaches of Kua Bay and Makalawena, before returning to Kona airport. If you love beautiful sandy beaches and want to drink up the atmosphere of the classic Hawaiian lifestyle, our Coast Line tour is the perfect adventure for you! Love nature's majesty? Then enjoy this stunning flyby of some of the hidden sites that Hawaii's diverse climate can offer. On your flight to Waimea, your helicopter will dip down into the valleys to get up close and personal with Hawaii's waterfalls. Overfly Kohala Mountain, then come back up the coastline to Kona. On your 2 hour private adventure over the Big Island, you will see a diversity and beauty that rivals any other place in the world. Departing from the convenient Kona Airport, you will head for the most active volcano in the world, Kilauea, which has been continuously flowing for over 30 years and inspires awe every day. While on the east side of the Island you will be treated to views of our largest city, Hilo, and its magnificent bay. Your private journey continues along the Hamakua coast with wave-swept shorelines, tropical rain forests and hundreds of waterfalls. Upon reaching the Kohala Coast, there are several majestic and sacred valleys to explore. Deep in the back of the valleys, where ONLY a helicopter can reach, are over 2000’ waterfalls that you can hover right next to as you gaze at their power and beauty. As you cross over Kohala Mountain, you will cruise over the Gold Coast, home to some of the finest resorts in Hawai’i. 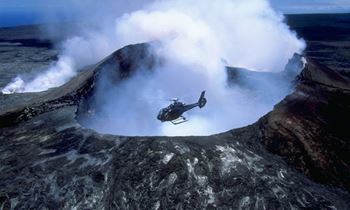 This adventure is available in our 3 passenger (R44) and 4 passenger (R66) helicopters. Daily 7:45 AM - 3:45 PM Must be booked 2 days in advance. Check in location directions will be included in confirmation email, see map below for approximate location. What are the advantages of a helicopter tour versus an airplane tour? 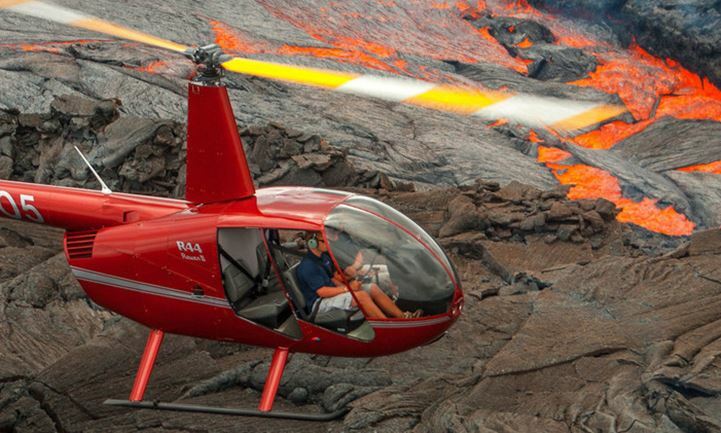 Because of their agility and small turning radius, helicopters can fly you right into the heart of Hawaii’s geological gems, such as the many lush valleys and sprawling canyons, while fixed‐wing aircraft have to circle above. Helicopters allow you a more intimate look at the terrain. Because our pilots can slow down and turn the aircraft around some of the famous highlights, you can take a more leisurely look and are given enhanced photo opportunities. Also, when was the last time you were in a helicopter? 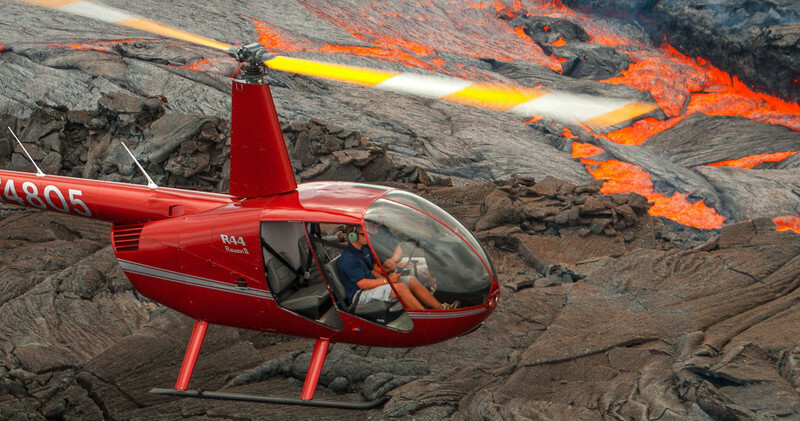 When is the best time to go on a helicopter tour? There is no short answer. Although Hawai’i enjoys plentiful sunshine year-round, we do experience summer and winter seasons. Precise flying weather conditions are often impossible to predict, especially in winter, because of the interplay of dynamic weather patterns and the island’s unique topography. Due to the combination of high mountainous peaks and shoreline throughout the islands, each hour of the day shows each island, literally, in a different light. Wind speeds and cloud formation also change throughout the day, resulting from variations in temperature. Ultimately, the time of day you book depends on your preference and itinerary, but we recommend choosing a tour date early on in your stay. This allows you more opportunities to find a different tour time with us should the weather not cooperate for the original flight. Will there be other passengers on our flight? No. We feel that you should not have to share your flight. Therefore, we fly exclusively private tours for parties of two, three or four. On our most popular tour for two, we purposely leave the third passenger seat vacant. This way you will not have to share the aircraft with any second party. This is your tour. I am traveling by myself. Can I take your tour? Yes. 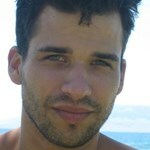 The requirement is to pay for a minimum of 2 seats on our standard adventures. You can also private charter the aircraft as well. What is better for me—a doors-on or doors-off helicopter tour? Both options allow for optimal viewing, as each passenger is guaranteed a window seat with wide windows extending from the top of your head to your waist. The choice to fly with or without doors depends on your priorities and comfort level. In a closed aircraft, you are shielded from wind exposure and you will hear music and narration clearly. It is a very serene way of taking in the scenery through the large windows. If you are game for a more visceral experience or photography is important to you, our doors-off adventure is for you. Floor-to-ceiling openings allow you to look straight down into waterfalls and sea caves, and glare from windows in your photos is no factor. Because the helicopter is open to the elements, you will be exposed to wind and cooler temperatures caused by airspeed and altitude. For your comfort, please follow our recommendations on how to dress appropriately for your doors-off helicopter flight. The airframe does protect you and your camera equipment well during light showers or mist. For passengers with differing door preferences, we have the option of seating one passenger upfront with the doors on, and taking just the rear doors off for the back passenger(s). However, all seating arrangements are subject to weight and balance calculations. For doors-on and doors-off tours, please abide by our recommendations on how to prepare for your flight so you can make the most of it. Also a reminder that we don't charge any more either way you choose. What will we see on our private helicopter tour? On these magnificent islands, there is much to be discovered by air. Certain of the countless remarkable features have, deservedly, garnered special interest and are most popular for aerial viewing. Weather permitting, our pilots will explore with you all of each islands most famous geological features as outlined in our tour descriptions. Sometimes, wind and weather conditions necessitate a deviation from the usual tour route. In these instances, our pilots will attempt to show off other spectacular scenery not normally included on the tours, as all islands offer more hidden wonder to please the eye than can possibly be covered on a single flight. We guarantee to showcase spectacular scenery and breathtaking views that are not obtainable by car or trail. What happens if it is cloudy or rainy on the day of our tour? Along with ample sunshine, the islands are also blessed with abundant daily rainfall, which nourishes the lushness , and creates the erosive force that continues to shape all the fascinating geology. Most of the island’s waterfalls are sustained only by rainfall, and misty showers often delight passengers with rainbows along the tour. Usually, our typical high cumulus clouds and precipitation do not diminish the quality of your tour, but instead give it dimension and add other exciting facets to your experience. However, if the pilot determines that prevailing visibility, cloud cover or wind speeds do not allow for a good air tour, or if it is not safe to fly, we will of course cancel the flight. Because weather conditions can change dramatically day to day and hour by hour, we often cannot make a determination about your flight prior to your check‐in time. What if our flight gets canceled due to weather? If we cancel a flight due to weather, there is naturally no fee for you whatsoever, and you are not required to rebook your tour. We are happy to reschedule your flight based on availability. Because we provide an exclusive private tour, we do not offer discounts. Our tours are value-priced and we maintain a policy of price integrity. However, we waive all airport fees and fuel surcharges. What is the passenger weight limitation? Total weight per seat is restricted to 275lbs. We do not impose any weight surcharges for individual or combined passenger weights. Per FAA regulations, all passengers plus carry-on items will be weighed at check-in. I am pregnant—can I go on your tour? You are most welcome to fly with us through the 7th month of your pregnancy, providing you feel comfortable with the motion of the helicopter in the air, as well as wearing a regular (3-point) seat belt across your body. What is your policy for children on the flight? For everyone’s safety, we do not permit lap seating. Each passenger, including your child, must be secured with a regular-sized seat belt in his or her individual seat. For this reason, our minimum passenger age is 7 years. Generally, we recommend that children under 12 be seated next to an adult in the back of the helicopter. What is the best seat for photographs? Generally, the rear right seat is considered ideal for photography since it is closest to the pilot’s view and you are traveling clockwise around the island. However, our pilots are skillful in selecting a flight path that affords passengers on both sides of the aircraft the same amazing views. In terms of seating arrangements, our first priority is safety, meaning we seat people in the best spot for the weight and balance of the aircraft. Our next consideration is where passengers would like to sit and what seat will be the best for their experience. We will be happy to accommodate your individual preferences, weight and balance permitting. Most couples like to sit together in the back of the helicopter so they can better share the experience, lean over and see out both sides, and point things out to one another. There is emotional value to sitting together, which for most people is higher than any added viewing value obtained from the front left seat. The open cabin design also allows rear passengers viewing ahead through the cockpit window. How do we prepare for our flight? Your check-in time is 45 minutes prior to your flight time. Per FAA regulations, we need to determine each passenger’s exact weight including shoes, all clothing, and personal belongings such as camera equipment and purses. It is therefore necessary that you bring to your check-in everything that you would like to wear and have with you on your tour. You do not need to actually wear your warm layers at check-in, but you do need to hold them when stepping onto our scale. On a doors-on flight, we recommend that you wear dark outer layers to minimize reflection in the windows during photography. Because you are not exposed to the elements, whatever clothing you are comfortable with at sea level is adequate for your flight. An open-door experience is exciting and fun and we want you to enjoy your flight without being distracted by wind or chill. A warm outer layer that you can zip up, such as a windproof jacket, is ideal. We strongly advise against wind-susceptible clothing such as dresses and hooded items. In winter, long pants are highly recommended. To keep you and your belongings safe, we cannot permit any loose objects on your doors-off flight. This includes hats, visors, scarves, hair clips, and strapless sandals. Eyeglasses are permissible. Hair that is long enough should be tied tightly with an elastic band. Any equipment must be secured to you via a strap. Do I need to worry about motion sickness? Our experienced pilots choose the best flight path given prevailing wind speeds and topography, avoiding areas of known turbulence and making gentle turns and altitude changes. Very few passengers experience any queasiness. However, if you are particularly prone to motion sickness, we do recommend that you prepare with oral motion‐sickness medication so you can enjoy your flight, free from worry. Can we talk to the pilot during the tour? Yes, you can! Except during critical flight stages, such as take‐off and landing, feel free to ask a question, share impressions or comments, and engage with the others onboard. We provide inter‐communication between all occupants of the aircraft as an added bonus. Flight safety is our principal concern and we are proud of our impeccable safety record. We have a zero-tolerance maintenance policy, meaning any issue, regardless of its effect on airworthiness of the aircraft, is checked out promptly and thoroughly. With extensive training and flying experience, each of our pilots has acquired expert knowledge on the island’s unique weather and terrain considerations, and this knowledge is a key factor in making sound decisions and navigating the skies safely. For your added safety, we do not practice “hot-loading”. We shut down our aircraft in between all tours to allow for a thorough pre-flight inspection prior to each and every tour, and our passengers. I just want to know if it is available, how can I find out? Click on the red "Book It" button and you will see live availability. Keep in mind availability changes constantly, so make sure to book in advance! Do I really have to book in advance? Can I just "show up" or pay when I get there? 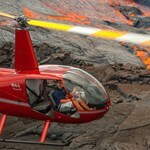 H Tours Hawaii is a "one stop shop" for all the best activities in the Hawaiian Islands. Since we work with many providers, reservations are necessary. WE HIGHLY recommend making reservations, as many activities are at a discount when you reserve in advance. Some providers even charge higher for those "walking in" because they know chances are you're not going to walk away. Finally, a reservation ensures you have a space on the tour. Trust us you don't want to spend so much time and money to come to Hawaii and then miss out on an activity because they were booked out! Cancellations made 2 days before Date & Time will be fully refunded.